With the help of the friendly dinosaur Pantosaurus, talking PANTS is a simple way to teach your child how to stay safe from abuse. We will cover this in our PSHE lessons, but you may like to reinforce this at home. Please click the link below to take you diectly to the site. Shakespeare Infant school encourages parents and children to visit the CEOP www.thinkuknow.co.uk to keep you and your friends safe with Hector Protector and his friends. Security on our computer system is a high priority because there are so many users. 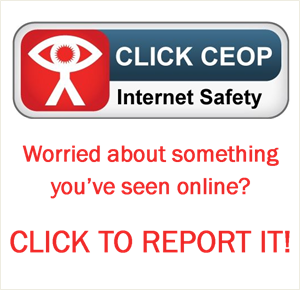 Shakespeare Infant school encourages parents and children to visit the CEOP website (Child Exploitation & Online Protection) to build knowledge of how to stay safe online;. This website has lots of fun activities which children can gain vital information on staying safe. Internet access at Shakespeare Infant School is filtered by our Internet Service Provider (ISP) but ultimately, parents and guardians of minors are responsible for setting and conveying the standards that their children should follow when using media and information sources. We also have a secondary filtering provided by a dedicated internet server/router. This provides additional filtering which allows the children to only view certain pages. Shakespeare Infant School has specially trained CEOP (Child Exploitation and Online Protection) Ambassadors who provide current advice on E-Safety to staff, parents and children. The following information can be found all around the school. If you have any worries or issues or want advice please talk to Mrs Kesterson. Never reveal personal information, either their own or others, such as home addresses, telephone numbers and personal e-mail addresses etc. Not use photographs of themselves on their web pages unless the parent/guardians have given permission to do so. Never meet people in person that they have contacted on the internet without a parent/guardians permission. Notify their teacher whenever they come across information or messages that are dangerous, inappropriate, or make them feel uncomfortable. At the beginning of the year children are taught a series of E-Safety lessons that build their knowledge of how to stay safe online. The children also have refresher lessons each term and we take part in the nationwide Internet Safety Day. Pupils could potentially have unfiltered, unsupervised internet access at home. All parents should be aware of the concerns and benefits of school internet use. Parents are therefore encouraged to look at government guidance available on the internet to help in the supervision of their children. We have also organised and will continue to organise E-Safety training for parents.